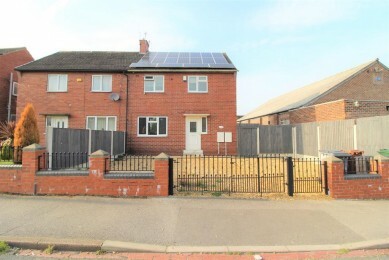 On offer is this generously sized 3 bedroom, semi detached property located in the very popular area of Barnsley. It boasts its own driveway and access to a detached garage round the back of the property. Including a good sized, easy to maintain garden, this property is ideal for first time buyers and families. This is a very good size room with ample space. It has a chimney breast. There is a large double glazed window overlooking the front garden and the same overlooking the rear garden which allows ample light into the living area. The flooring is a wood effect laminate which is hardwearing. The walls are painted white and has a feature chimney breast which has 3D brickwork wallpaper surrounding. It provides access through to the kitchen area also. The kitchen is a great size. It is well designed. There are a number of cupboards available as the kitchen units stretch along the whole of the side and back wall. The walls on the kitchen area are all tiled. The flooring is wood effect laminate. There is access to rear garden. The bathroom is a very good size and boasts a full 3 piece toilet suite and shower over the bath. There is wood effect vinyl on the floor and the walls are tiled. This bedroom is a very large double. It boasts a large, double glazed window allowing ample light to come flooding in. The flooring is carpeted. This is a good sized double bedroom to the front of the property with carpeted flooring and double radiator. There is also a double glazed window overlooking the front of the property. Large space with artificial grass. There is also access to a large outbuilding that has modern décor. It boasts a large garage space with extra possible living space to the side. It has its own electric supply including an electric garage door. The garage door leads out to the rear of the property which is accessed a little further down the road.